#UKvUSA: Who Really Chooses Paper? I am a little flustered with some of the Printers out there after last month’s duel. The overwhelming answer to “Who Really Cares About Color” was a resonating “Not us, beyond what the customers is happy with.” Profit and margins, margins and profit, and you guys still insist it is BUYERS that make everything about price. I’m mentioning this because there is no conversation about paper that doesn’t include a price tag. Paper is a commodity; it’s sold by weight. Paper Mills want you to use their paper, Paper Merchants want to sell printers paper from mills they represent, printers sell paper to buyers, buyers are selling finished paper products to their clients, and those clients are using them, or passing along to consumers as the final end-user. It’s a looooooong string of buying and selling that starts before what I described since paper is manufactured. Sure it mostly comes from trees, but paper doesn’t grow on them. Now that is out of the way… Paper costs money, everyone involved wants to make the most money they can. All paper choices have a financial impact on printing costs. In some, I’d even cop to most cases, paper is considered “interchangeable” and one of the first line items offered up for cost savings… You know, the infamous “house-stock” printers “have” at their shops that is just as good as what you specced, but a whole lot cheaper. Ever see a “house-stock” room filled with paper at a printer? I have, but they call those rooms warehouses, and they are located at Paper Merchants. I digress. Let’s pretend for just a moment that we all have the luxury of picking the best paper for the job at hand, without any interference. Paper is a strategy, a communication tool and a delivery device. How do we learn what works best, and who makes the ultimate decision for what is used? Depending where you sit in the Print Buying food chain (advertising/marketing, in-house corporate/procurement, or broker) there are too many varying paths to purchase to review here, so let’s break it down and look at paper the way the industry does to see who cares about what we use, and why. Paper Mills. They spend their time, money and effort providing education and tools to help print customers (and printers) understand how to best use their paper. It is in their best interest to create educated users, repeat customers, and be part of successful print. CALL THEM. Get swatch books. Go to webinars. Go to paper shows. 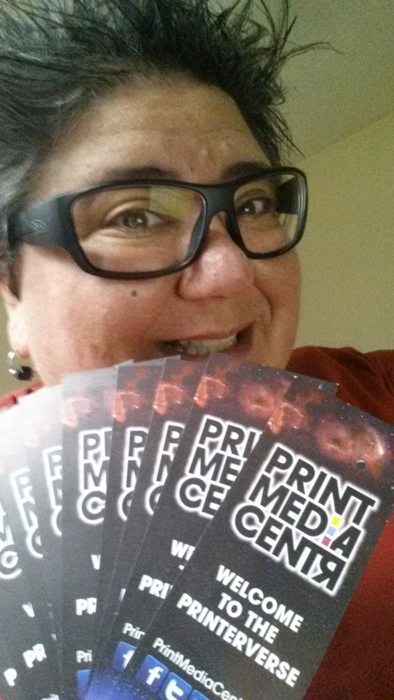 Get samples of printed materials. Let them help you make your choice. Paper Merchants. They are one of the most untapped resources out there. Find your local/regional merchant. If you can’t, ask your printer whom they buy paper from, or try the NPTA for members in your vicinity. Though you can really work with any Merchant, local (or as close as you can get to where you are printing) will work out better. When it comes to paper choices, Merchants have warehouses filled with them. And yes, while they will only discuss the mills they represent, it covers more than enough options. Merchants are incredibly knowledgeable about what paper to use for what job, what press, what is available, what can be special ordered, and yeah, even what can save you a few bucks. PLUS, they will make dummies on actual stock! Developing relationships with the Merchants will expand your paper choices … and your swatch book library! Press Makers. No manufacturer wants to see crap print coming off their machines, especially when the recipe for success has been carefully developed and tested. The OEM’s have “approved” paper partners. 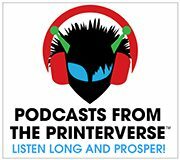 They participate in conversations about paper, and color management, and lead conversations about new substrates that help open new markets and create new revenue for printers and their customers. Ask them. Visit their sites. Pay attention to their design partners and the brands that advocate for them. Take their lead, and trust they want you to be very successful every time you print on their press! The Printers. Yeah, they care. Maybe not for the same reasons Buyers do, but ultimately like the Mills and the Manufacturers they dont want crappy print associated with their business, or lose customers over it. I am going to leave it there because after last month I can’t have my heart crushed again. Just be sure the printer you work with has more than their wallet as motivation when it comes to paper recommendations and options… and they care about the craft of printing. Even a little is better than not at all. <—HOW SAD…. sniff. The Community. Everything above provides a means or a method for making the best paper choice – but it is controlled. For some, especially our Millennial colleagues; peer-to-peer recommendations may trump reaching out to the industry. My only advice here is know who you are talking to and don’t get “catfished” by someone with an agenda, or a guru/expert degree in self-promotion. Join LinkedIn Groups (like mine! ), design communities, print production communities, attend local events, national events… and make connections with other paper lovers! This post is over our self-imposed 500-word limit, but I had to get in my rant regarding last month’s duel. Be on my side this month, and I can deliver August within range! Until then, the answer to who really chooses paper is YOU – with a lot of outside influence! Reminds me of the “cerulean smackdown” from The Devil Wears Prada! Next month: #UKvUSA: What Matters More: Price Or Value? PS: Check out the national pro-paper consumer advertising campaign “How Life Unfolds” …and bust anti-paper myths and corporate greenwashing by clicking and sharing facts from Two Sides North America, or the Two Sides closest to you in the country dropdown on the site! Having grown up in this business, I learned a lot about paper and how important the right choice is to the overall print project. The paper and print industry has changed dramatically over the last few years and what was true then doesn’t always apply now. In coated sheets, there used to be dramatic differences in price and quality between the premium sheets, the number ones, twos, and threes. Much of that has disappeared as technology has made sheets indistinguishable to the vast majority. Most volume jobs are driven by costs and I see most specs come in as generic ( 80# coated as opposed to say 80# Utopia 2 ). In the uncoated and text grades, there are far fewer choices then there once were. Designers used to revel in using the next new stock with speckles or ridges. That was fun for printers too but much of that has disappeared. Again, commodity grades got better and better and are deemed to be all the same to many. As far as who picks stocks, I would encourage the process to start with the designer. Their choice indicates the look that they want to achieve. They should be open to suggestion however from the printer. If there is a comparable brand that could yield big cost savings or better availability, it would be foolish not to make a consideration. The ideal for making a project serve it’s intended purpose is for a good collaboration between the designer and the printer, often with the production manager serving as a catalyst.